When an out-of-town escape isn't in your budget, a staycation can provide the R&R you require. The place you live has plenty going on if you know where to look. Start planning your summer staycation today with these tips on how to do a lot while spending very little. Some hotels and resorts have resident-only discounts, especially in the offseason, because they, just like us, need to pay the bills. If they're not listed on the company's websites (they're often not), pick up the phone and call. If there aren't any resident-only deals, ask about other savings, like AAA, student, military, or senior citizen discounts if any of those apply to you. I've found that many boutique hotels welcome locals to their summer events, if only to build a rapport with year-round residents. For instance, I've stayed at several mini-resorts that offer free cookouts during the summer to which local residents are invited. You can use the pool, grab a burger, and socialize with other staycationers or even out-of-towners if that's your thing. Visit the websites of local hotels to find out what's going on and send a quick email to ask if you're welcome to swing by. My boyfriend and I have started making our own adventures lately, most recently with a hike through a state park and a hike to a waterfall for an afternoon picnic — and neither of these activities cost us a dime. I'm also a big fan of the Bivy app, which helps you find nearby DIY adventures based on your location. You also should check your town's Chamber of Commerce site, which will likely have plenty of events on their calendar. I try to pop into one museum, zoo, or other education center when I visit a new town, but I never just show up and pay the fee. Instead, I look on their websites and social media accounts to see if there are days and times when the doors are open for free. Groupon and LivingSocial are still a relevant source of savings, so make sure you check their deals before your staycation. In fact, Groupon recently featured up to 80 percent off its list prices for local activities, which in my area consisted of escape rooms, arcades, spas, obstacle races, yoga classes, pistol ranges, and more. While saving is a big part of planning the best staycation, so is relaxation, and the only way you'll be able to do that is if everything else in your life is in order, especially your home. When you go away for a traditional vacation, the laundry, dishes, and other chores are hundreds of miles away, but it's much harder to block out these tasks when they're staring you in the face. Sometimes my travel itineraries are so full of activities and reservations that I don't have time to breathe. And God bless my poor boyfriend — he's just following me around hoping for a water break. 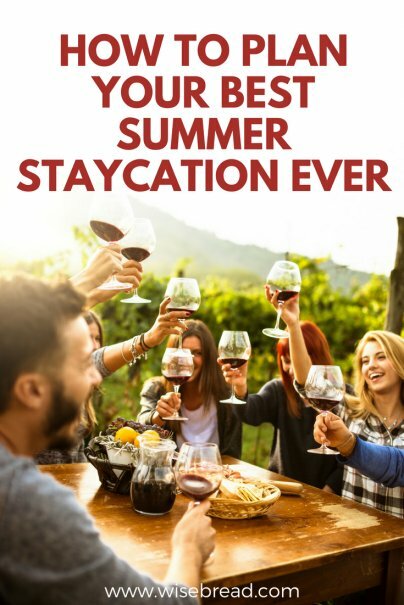 You don't have to fill your schedule to the brim like I do, but you should create a staycation itinerary so you have a solid plan in place. Otherwise, you'll spend a good chunk of your day trying to find something to do, or worse, you'll lose motivation and end up doing nothing. The fun of a staycation lies in the excitement of finding new-to-you things to do without going far, so try to keep it fresh every day. "Go somewhere you've never been before — maybe a close-by lake, a new hotel, water-park, museum, or attraction," suggests Jamie Harper, family travel blogger at FlyByTheSeatOfOurPants.com. "Even a library or park in a neighboring town will have different offerings of free programs. Go to an outdoor festival or music show. Create a passport for food places you've never been and give yourself stamps once you try them out." Disconnecting from our devices to enjoy real life is hard, but you've got to give yourself a break every now and then. Keep the phone around for emergencies, but try to stay off it as much as possible. I find it helpful to delete my social media apps during my blackout period so I'm not mindlessly checking them every three minutes. If you like to take photos of your adventures, use the camera, but wait until the end of the day or the end of your staycation to share them. Truth is, nobody's on pins and needles waiting to see what you're up to, so the sharing can wait. Yes, you should get out there and do something during your staycay, but don't be afraid to do nothing, either. If you want to sleep in every day, do it. If you want to veg out on the couch on a rainy afternoon binge-watching shows on Netflix, do that too. Just don't fill your entire time off with things you can and probably already do on a regular basis to waste time or quell boredom. Lounging is OK in moderation, just don't make it the foundation of the staycation, or it won't feel any different from your average day off or nightly routine. You've saved big bucks by not purchasing airline tickets, and not paying for a hotel room every night — which is hundreds of dollars still in your pocket — so why not splurge a bit? "Go out to that nice restaurant and order that bottle of wine that you never order," says Byron Ellis, a certified financial planner and founder of Texas-based Doing Money Right. "Pay for upgraded tickets to the show. You deserve it! In the end, you still want to spend much less than if you had gone out of town, but you don't have to make it feel like you are on a budget."